Hello everyone, I hope you've had a great week. 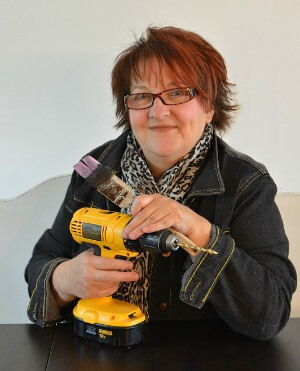 For those of you who like to knit, sew or do needlework while watching television, then you'll like the makeover I'm sharing today. 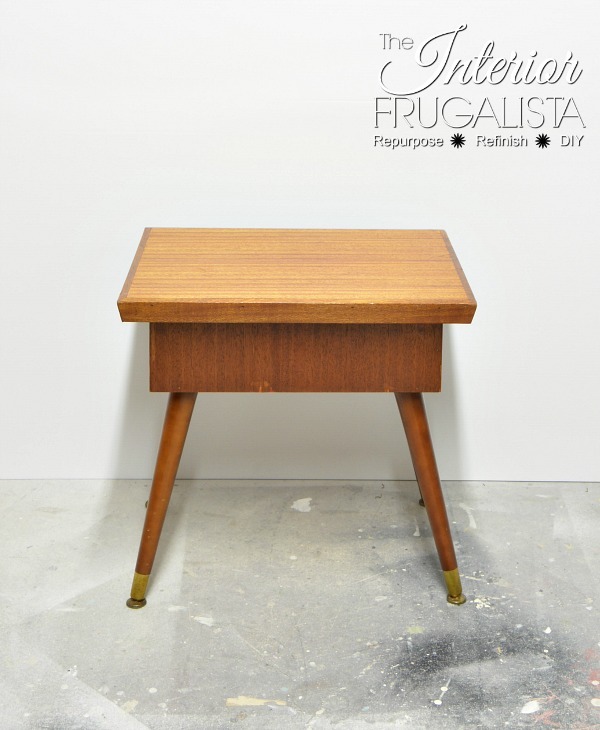 Several months ago Mr. Frugalista came home with this interesting little mid-century modern hinged top table. It is rather low and I had no idea what it's intended purpose was and so it sat in our basement collecting dust. ...and here it is open. Perhaps I'm wrong but doesn't it look like it may have been handmade? Our grandson's two year birthday is coming soon and so I thought the table might make a special handmade gift from Grandma. 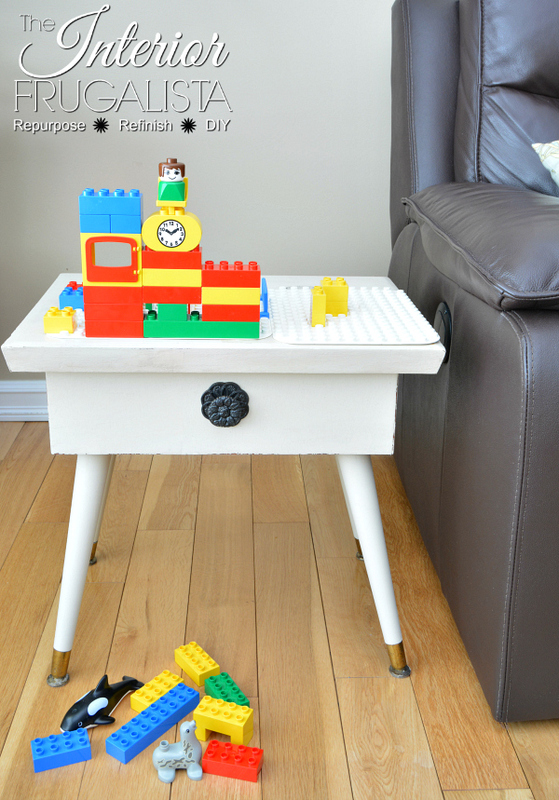 The intention was to turn it into a Mega Block Play Table with storage for blocks underneath. When he was over recently I decided to do a trial run before starting the makeover. Good thing I did because the first thing he did was climb on top. Once he figured out the top opened he had more fun opening and closing the lid than he did to what was stored inside. Onto Plan B. 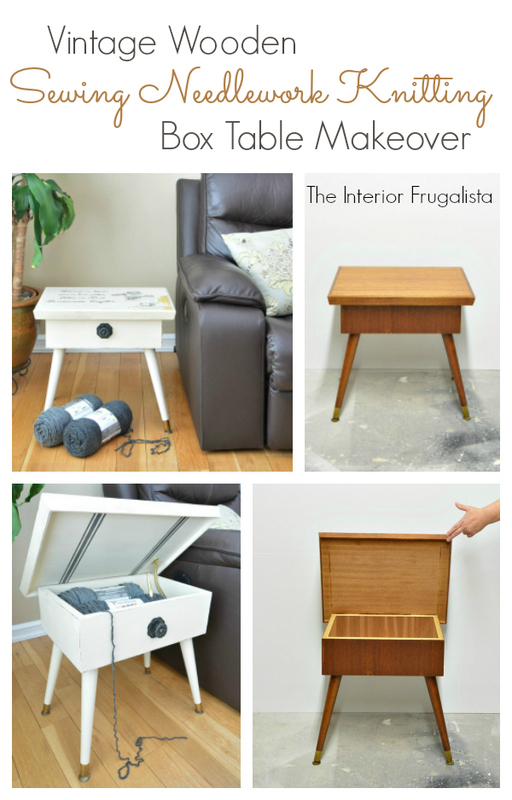 Recently my friend Larissa from Prodigal Pieces turned a magazine table into a fabulous sewing table. 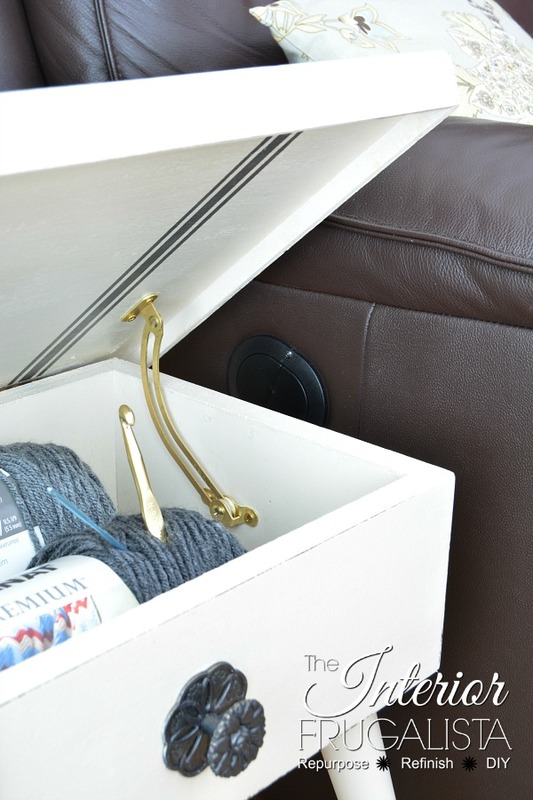 Inspired by her makeover, I decided my little table would be a perfect catch-all for yarn, embroidery, or sewing supplies for projects completed while watching the television. Little did I know, that is exactly what these vintage wooden box tables were used for back in the day. I painted the entire table, inside and out, with two coats of Dixie Belle Paint in the color drop cloth. Normally mid-century modern furniture has a smooth clean paint finish but sometimes you just have to break the rules. I lightly distressed the edges on the top to give it a timeworn look. I always line my pieces with fabric or paper and found the perfect linen patchwork scrapbook paper in my stash. 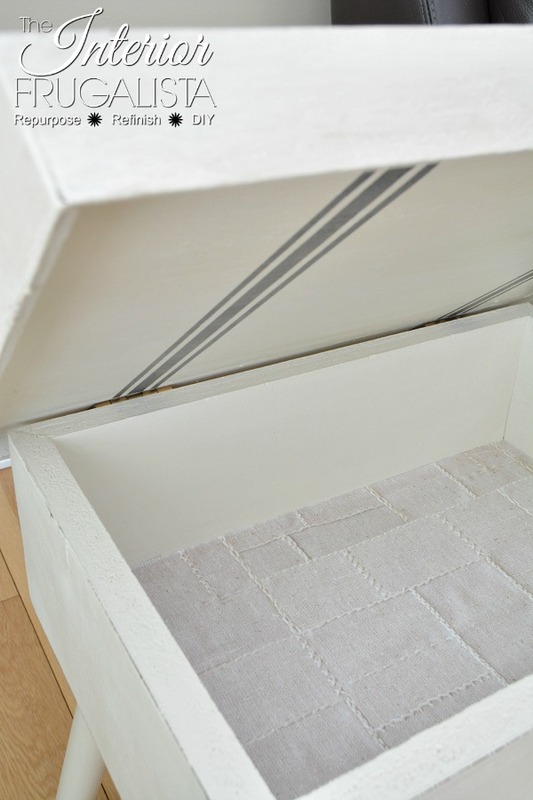 Notice the grain sack stripe detail on the inside of the lid? 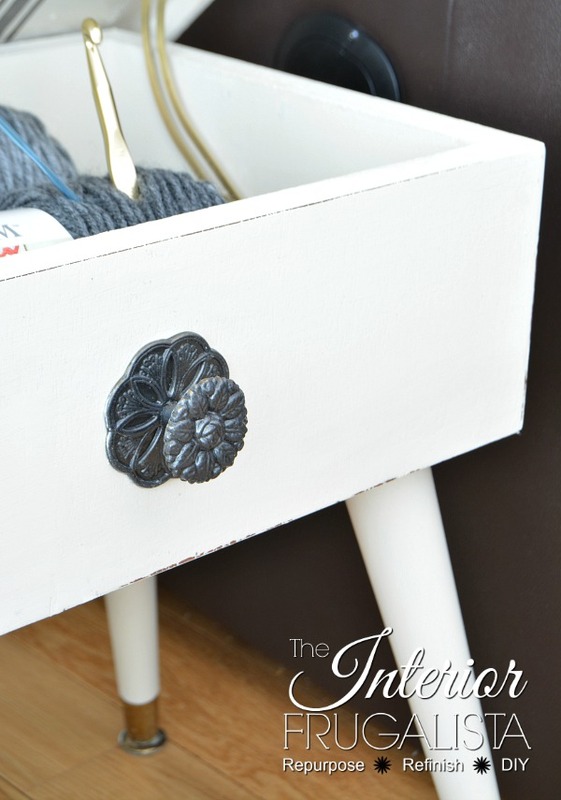 It's a stencil with the chalk paint color Rocky Mountain (a charcoal gray). 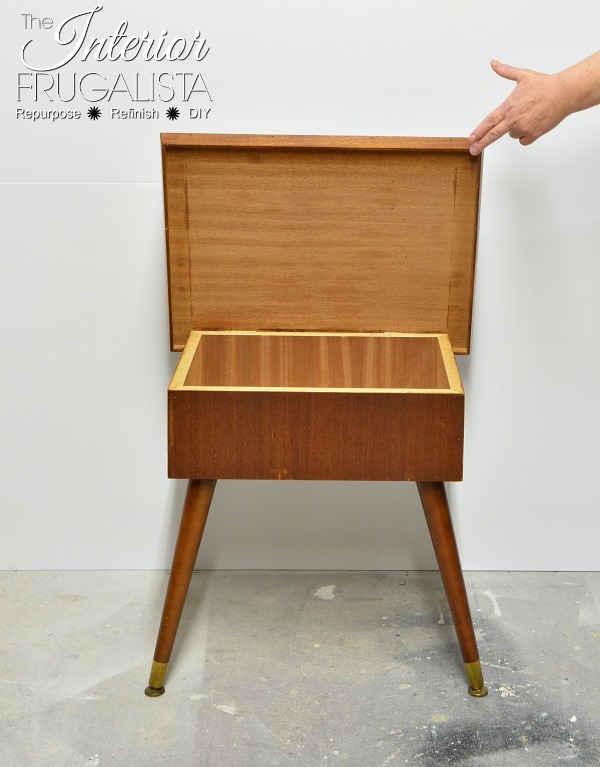 Nobody has time or patience to open the lid every time they need something while busy stitching so Mr. Frugalista installed a curved locking lid support mechanism to keep it open. The front of the table was looking rather bland. In my stash, I found a pretty rose furniture knob with a backplate that would dress the front nicely. 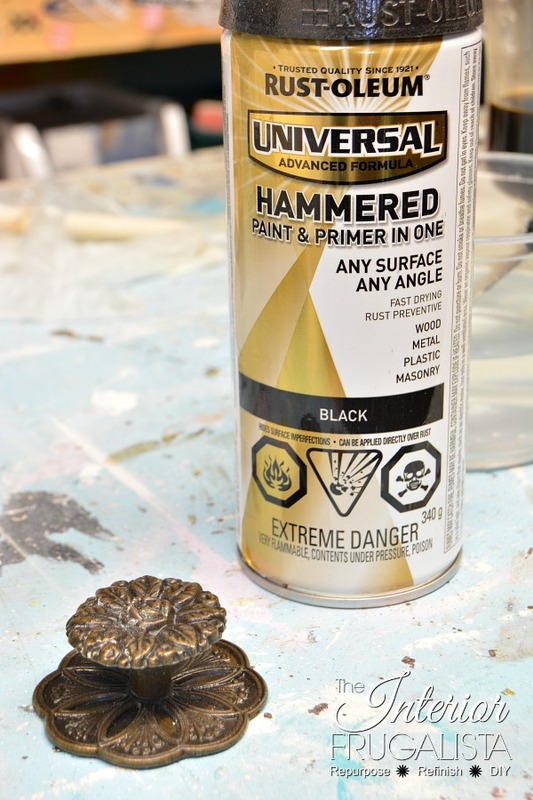 Not liking the antique gold finish, I changed it with black hammered metal spray paint. To protect the hardware I gave it a spray of clear coat. I like the contrast against the white and how it echoes the charcoal gray grain sack stripes when opened. The top needed a little something-something to identify its purpose. I cut an image from a sheet of scrapbook paper and decoupaged it onto one corner using Mod Podge. I wrote a little verse in PicMonkey and reversed the text in a mirror image and printed it using my inkjet printer onto glossy paper. Using the back of a spoon I rubbed the image onto the table. Then I went over to the Graphics Fairy website and found Retro Sewing Pin Cushion and Vintage Sewing Embroidery and Thread Spools graphics. Also printing them in mirror images and applying the same image transfer technique as the verse. The last step was sealing the images but I encountered a little surprise. 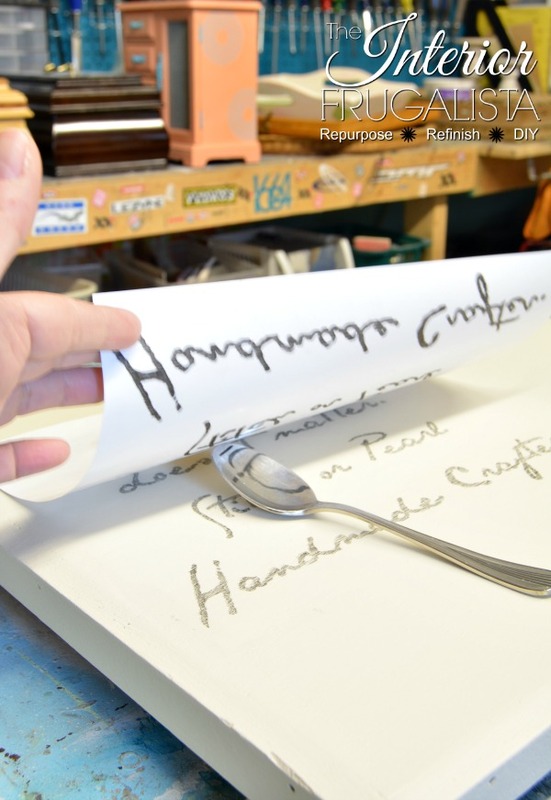 Normally if you give the ink at least 24-hours to dry there is no problem applying a top coat to seal the graphics. When I applied mine 48-hours later the image started to smear. That has never happened to me before. The only difference this time was that I painted the table using mineral-based paint. 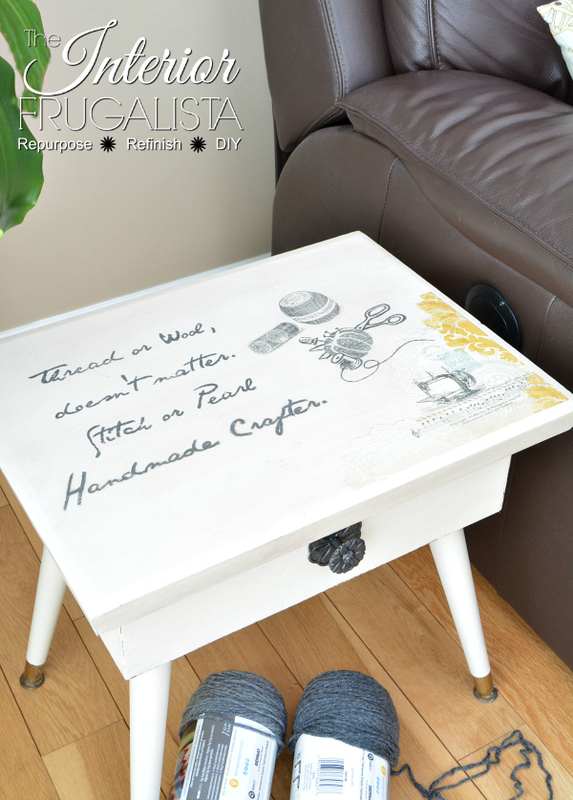 In the past, I've always used chalk paint which is porous and allowed the ink to penetrate into the paint. Mineral based paint has an acrylic resin base which makes it water resistant, therefore not allowing the ink to be absorbed into the paint. 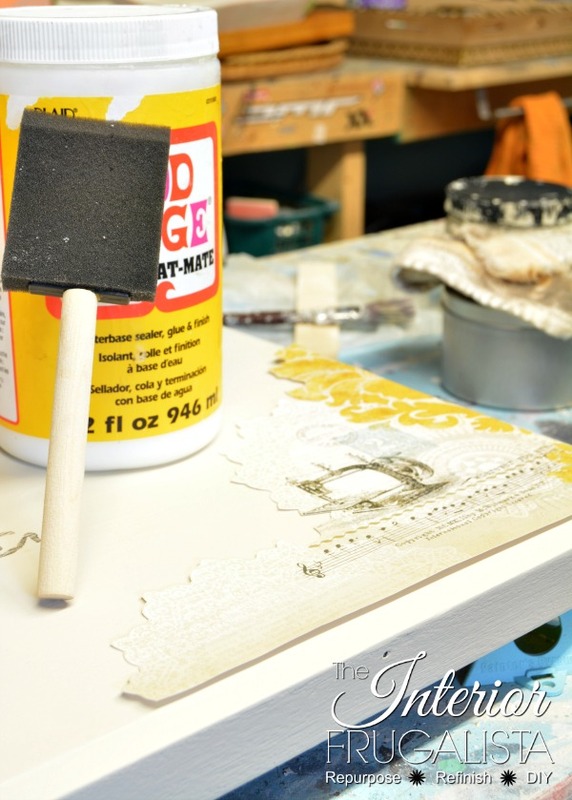 So my suggestion when using this image transfer technique is to use porous milk or chalk paint. 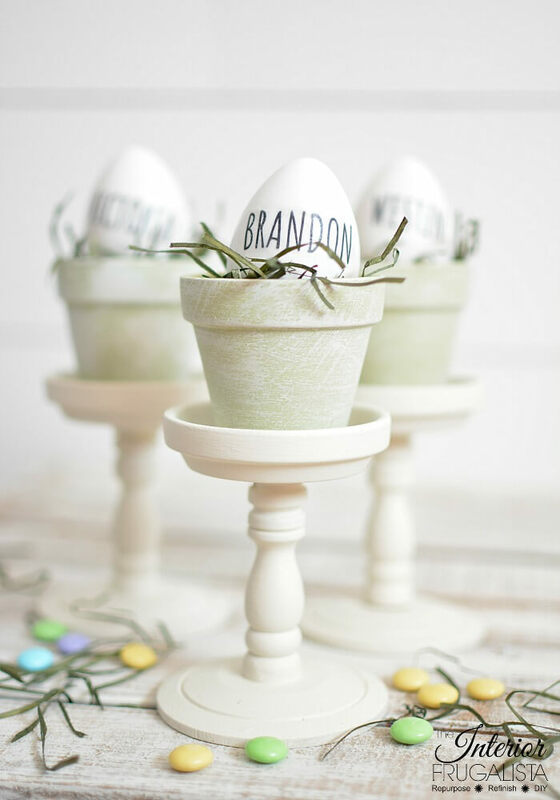 Using a script liner art brush and the same Rocky Mountain chalk paint color used on the grain sack stripes, I painted as much detail as I could. Once it was dry I sprayed a light coat of clear protective finish over the graphics and typography. Once the clear coat dried I was able to brush Dixie Belle Gator Hide, a waterproof protective finish without any smearing. While the mineral based paint doesn't require a protective finish, knowing this table may have drinks set on it while watching television I decided to add extra waterproof protection. The rest of the table, including the interior, was brushed with Clear Coat by Dixie Belle. Wanting to add a vintage look to the table top, I applied dark wax over the clear coat, wiping away the excess. 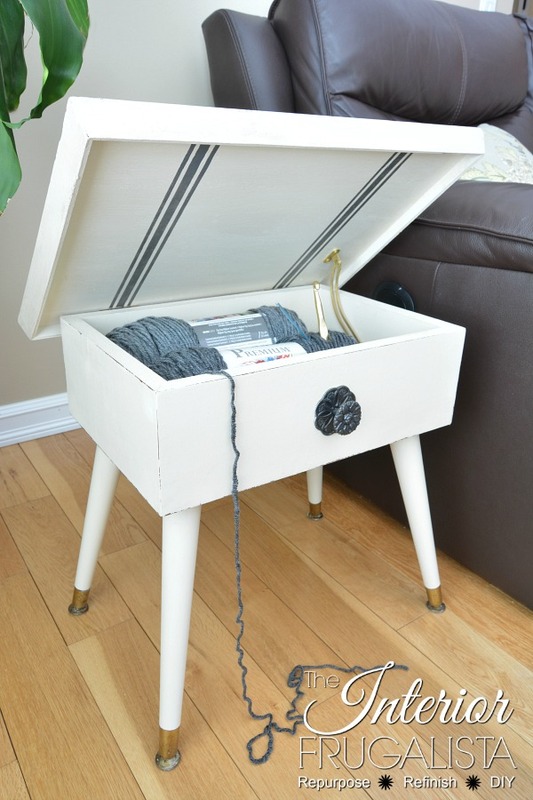 I think this Vintage Wooden Sewing Needlework Knitting Box Table with hinged top is so darn cute. Other furniture pieces where I used image transfer techniques is on a 1940's Art Deco Waterfall Buffet Sideboard, French Desk Makeover, and Queen Anne Writing Desk.